Another adventure only marginally related to caterpillars. This happened a few days ago. One of the undergrads in the lab, I’ll call him “The Minister of Silly Walks” (“Silly Walks” for short, he does an impeccable John Cleese impression) went with me to get lunch for ourselves and for the caterpillars. For us, that meant the Subway down the street. For the caterpillars that meant breaking branches off of trees as we walked, trying to not look terribly conspicuous carrying armloads of leaves as we casually walked along the street. On the way, I noticed some odd insects on the trunk of a dying maple tree. Upon closer inspection, I realized they were horntails! They are in the family Siricidae, in the order Hymenoptera along with the ants, bees, and wasps. This was the first time I had ever seen them in the wild, but their anatomy was unmistakable. 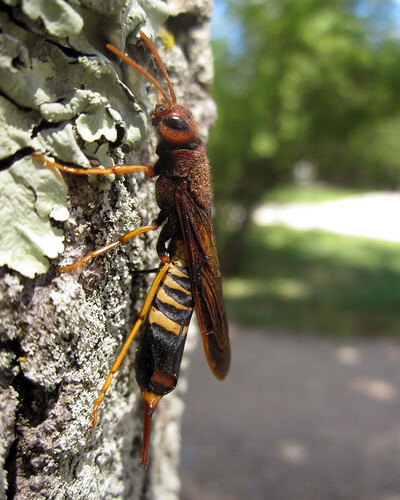 Wasp-ish but without a constricted waist, elongated body, and the characteristic “horn” at the end of the abdomen. I at first assumed this was an ovipositor, but as I examined the insects more closely, they were not using them to poke into the tree. Instead, they were wiggling their bodies side to side, not moving from their spots even as we approached with our cameras. It turns out the ovipositor actually originates much further up on the body, and is the thin black line you see extending from the horntail to the tree in the photo above (seen between the middle and hind leg). 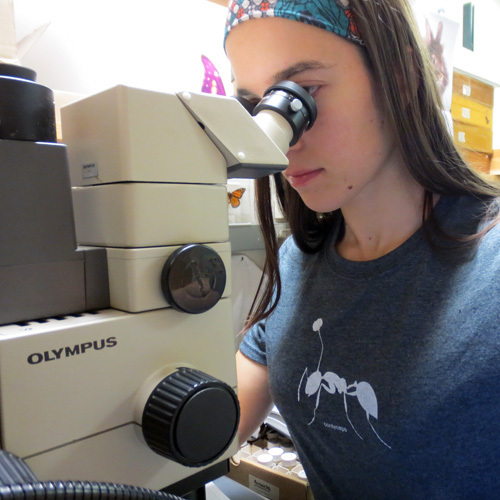 We determined this species is most likely Tremex columba, and the individuals we observed were all ovipositing females. They lay eggs into dying trees, and their larvae eat the soft bark. These larvae are often parasitized by Megarhyssa wasps, who use their long ovipositors to lay eggs directly into the larvae. Luckily for the horntails, there were no wasps in sight that day. Interestingly, some females died during this process, and were stuck into the tree by their ovipositor. Silly Walks decided to retrieve a few of these to bring back to the lab. This was one (successful) attempt. 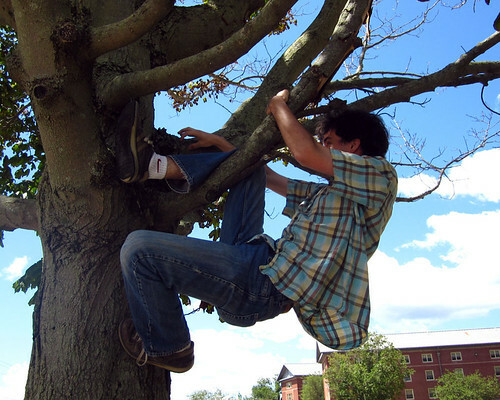 Ah, what entomologists will do for a prize. A couple nights ago it was raining, as usual. I kept my blacklight on, though, since it was just sprinkling on and off. Only a few moths came to the light, along with a smattering of beetles. I was about to give up and go to bed when I saw this lovely lady buzzing around. WOW!!! 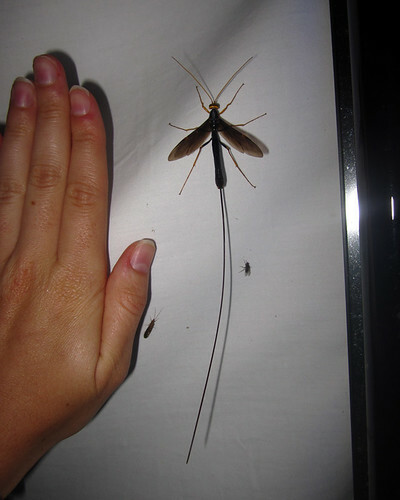 She is Megarhyssa atrata, the Giant Ichneumon, and take a look at that ovipositor! Female ichneumonid wasps such as these use that long contraption to bore into wood and reach a soft squishy insect target inside, usually a horntail wasp larva. 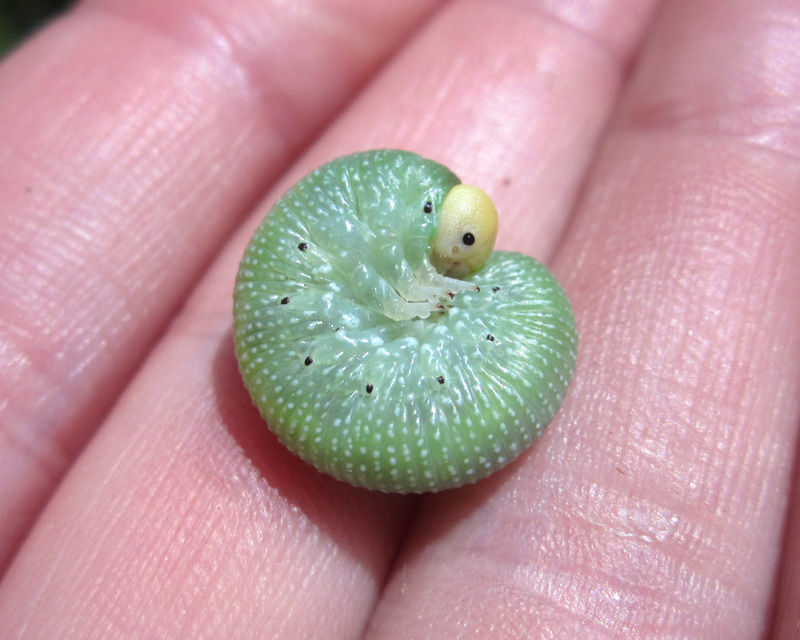 They will then lay an egg inside the larva’s body, and the young will hatch and eat it from the inside out. I had never seen one of these alive before, and pinned specimens are usually beat up and broken. I was so impressed (and sleepy) that I decided to let her live (hey, I keep a kill jar by the door for times such as these). However when I opened the screen door to go back in the house, she followed me in! So we played a game of tag around the lights in my living room for about 10 minutes, with her pretending to sting me every time I got my hands on her… until I finally wrangled her safely and threw her outside. She bounced off my blacklighting sheet a few times and fluttered back into the woods. Definitely an interesting encounter.